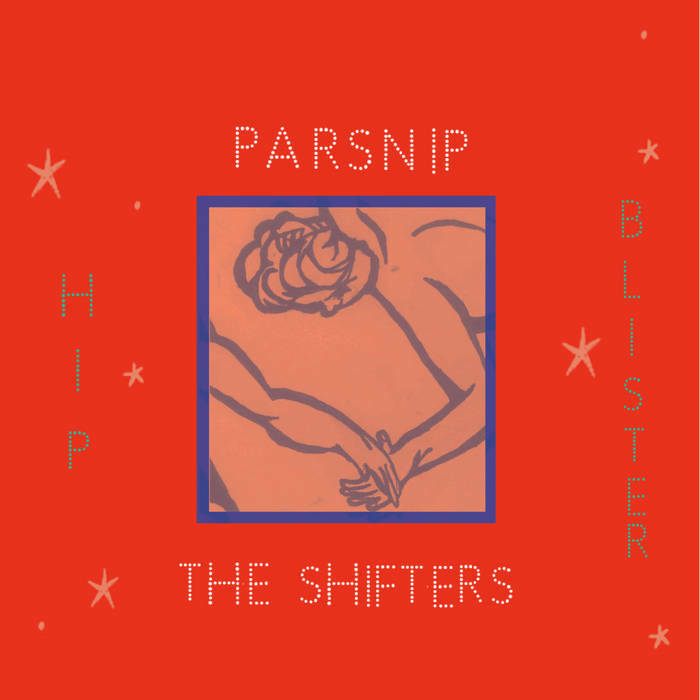 Hip Blister is a split LP featuring two bands from the thriving Melbourne scene in Australia: Parsnip and The Shifters. Parsnip, which includes Carolyn Hawkins, Paris Richens, Stella Rennex, and Rebecca Liston, perform the first three songs on the album, and The Shifters, comprised of Tristan Davies, Lloyd Davies, Ryan Coffey, Miles Jansen, and Louise Russell, perform the last three. For such a short album (it’s only seventeen minutes long) Hip Blister is packed with interesting songwriting and refreshing originality. Parsnip begins the record with “Counterfeit,” a sunshine-drenched jangle-pop song. Sweet and rough around the edges, the lead vocals and harmonies float and mix together like a swirl of syrup in a colorful mixed-drink. There’s an element of blurry-eyed nostalgia to Parsnip’s sound, as seen in the playful keyboard glissandos in “Dailybreader” that feel reminiscent of transitions between segments on a children’s television show. Still, in contrast with the music, the lyrics are anxious and sometimes claustrophobic. For example, in “Counterfeit,” the group questions whether or not it is possible to truly know someone, and in “Hip Blister” they shout, “I’m at the end of a chain but you keep tugging!” Its this juxtaposition of saccharine sentimentality on the surface and tense confrontation underneath that sets Parsnip apart from bands that merely wallow in hollow nostalgia. This girl band only adopts the flowery demeanor so that you don’t notice the spoon-full of cough syrup they’re shoving down your throat. The Shifters, on the other hand, are equally unrefined and sardonic in the subject-matter of their lyrics, but completely lack the veil of sweetness. The riffs are repetitive and hypnotic, recalling the deliberate minimalist approach of early punk bands like The Velvet Underground. While the overall feeling is downright dark and bleak, the story-telling in the songs is excellent. In particular, the last two tracks offer unique perspectives on historical events. “Conscript” is told from the point of view of a young Australian soldier sent to Vietnam in 1966. Conscription for compulsory military service for twenty-year-olds was mandatory in Australia during the Vietnam War and I found it interesting to hear an angle of the war that was new to me. The brutally repetitive nature of the music also makes perfect sense in the context of the story, as illustrated in the descriptive lyric, “all it is, is back and forth between boredom and sheer terror.” The final song, “Righteous Harmonious Fists,” is approached from the viewpoint of a desperate farmer who joins the Boxer Rebellion in China. The Shifters’ blend of historically-set dramas and politically-charged lyrics are engaging and distinct, feeling like a much-needed detour away from the usual relationship songs and list of issues that have become cliches in popular music. While Parsnip and The Shifters have distinct approaches to songwriting, their energies compliment each other very nicely. In essence, they are both two sides of the same coin, calling our attention to the contradictions and uneasiness inherent in the past, present, and future. Hip Blister may lack the polish of more expensive heavily-produced releases, but what it lacks in perfection, it makes up for in character. Besides, with two cool bands for the price of one, how can you lose?